LAS CRUCES, New Mexico ? Dignitaries are sharpening theirspeeches, Shovels are at the ready. Hard hats are being polished. Adirt-shoving grader is undergoing a tune-up?and organizers are cooking up ahush-hush list of surprises. Hundreds of onlookers are gathering here for the formalgroundbreaking ceremony of SpaceportAmerica, the world?s first purpose-built commercial spaceport. The June 19 event is being billed as a major step in thehistory and future of spaceflight ? with Spaceport America serving as alaunch pad for a new era of commercial space, including the boosting of publicspace travel to the suborbital heights. Weather and flight test program permitting, the WhiteKnightTwoaircraft is due to cruise by on a long duration sky hop from California?sMojave Air and Space Port over to Spaceport America. That huge mothership of a craft, now undergoing anever-expanding list of test objectives, is designed to eventually haul to dropaltitude ? some 50,000 feet ? the six passenger/two pilot SpaceShipTwosuborbital rocket plane ? the one-two punch behind Sir Richard Branson?s VirginGalactic spaceliner operations. The sprawling inland Spaceport America is to be built upon27 square miles, some 30 miles (48 kilometers) east of Truth or Consequencesand 45 miles (72 kilometers) north of Las Cruces. ?It?s coming together,? said Steve Landeene, ExecutiveDirector of the New Mexico Spaceport Authority. ?It pays tribute to the folksthat have put in decadesof work for this day.? Spaceport America is both an exciting, as well as achallenging project, Landeene told SPACE.com, and something that takeseverybody rowing in the same direction.
? ?The groundbreaking is an enormous milestone for VirginGalactic which is investing over $300 million in developing the new spacelaunch system which will operate at Spaceport America after it opens,? saidWill Whitehorn, President of Virgin Galactic. ?We have a long lease at theSpaceport and this groundbreaking event clearly signals the birth of a newcommercial age in space,? he said. Whitehorn also underscored the ?huge milestone? givenWhiteKnightTwo?s projected appearance as the megacarrier craft -- called Eve after Sir Richard Branson?s mother -- makes asoaring flyover of Spaceport America. ?This will be a record breaking non-stop test flight for theworld?s largest carbon composite aviation vehicle and put her firmly in therecord books,? Whitehorn told SPACE.com. 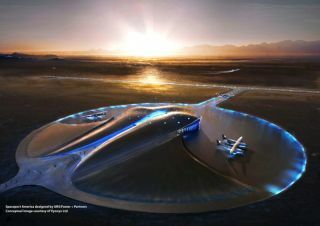 Landeene emphasized that Spaceport America is being gearedto build the momentum for a lively commercial space industry. While VirginGalactic is a key player in using the New Mexico facility, ?it?s not just aboutspace tourism,? he added, ?it?s about a brand new tool for scientificexploration?for light satellite delivery? and other purposes. ?We can?t have a spaceport that just has a one-sided mission.Because if that mission has a hiccup, then we and this investment are going tohave a very bad day,? Landeene said. ?The key is a diverse portfolio,? headded, including the delivery of small satellites into Earth orbit from thesite, for national security purposes, as well as carry out scientific researchand development. Indeed, along with the Virgin Galactic partnership, there?sUP Aerospace, the Rocket Racing League, Payload Specialties and MicrogravityEnterprises, Inc., and others that are eager to make use of Spaceport America.For example, Lockheed Martin Space Systems near Denver, Colorado has alreadybeen testing new launch and recovery technologies within the grounds ofSpaceport America. ?I see a paradigm shift?when we create this low-cost accessto space. These are brand new tools that the U.S. government did not have tofund,? Landeene emphasized. Landeene said that the core facility at Spaceport America istargeted for completion by the end of 2010. From there, it will go into tenantimprovement work, which could push the ?grand opening ceremony? of SpaceportAmerica into early 2011. The terminal hangar facility needs to be ready whenVirgin Galactic is ready,? he said, a structure that is the operational heartof the spaceliner firm and its storage of WhiteKnightTwo and SpaceShipTwoflight hardware. Undertaking and completing the infrastructure is a catalystfor economic development, tourism and education, Landeene emphasized ?The primemessage is that Spaceport America is the gateway to space.? Leonard David has been reporting on the space industryfor more than four decades. He is past editor-in-chief of the National SpaceSociety's Ad Astra and Space World magazines and has written for SPACE.comsince 1999.